On the morning of December 7, 1941, the Japanese attack on Pearl Harbor was meant to lead to the United States’ entry into World War II and to change the course of history forever. On that day, the Japanese forces managed to destroy nearly twenty American naval vessels, including eight enormous battleships, sinking four of them. Also destroyed were 188 aircrafts, and another 159 were damaged. Human casualties amounted to 2,403 American soldiers and 68 civilians, while another 1,178 soldiers and 35 civilians were wounded. 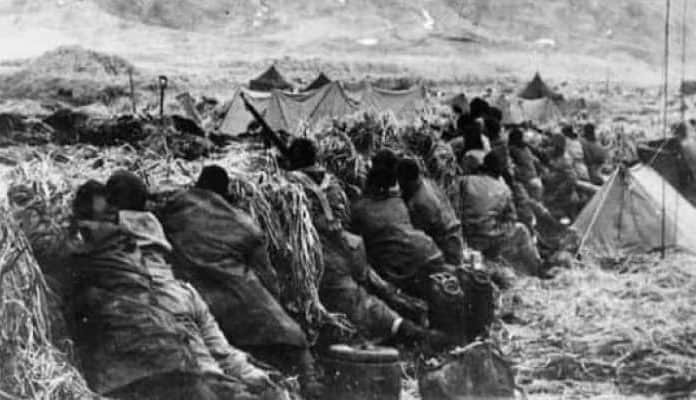 Historians tend to focus on the destruction done to Pearl Harbor and the effects of the attack on history, but history often glosses over those who died in other parts of North America – such as Alaska – during vicious battles of World War II. However, it is important to mention all of the effects of the attack on Pearl Harbor before we dive into the lesser known events. I believe that in the future, whoever holds Alaska will hold the world. I think it is the most important strategic place in the world. The USS Shaw explodes during the attack on Pearl Harbor, December 7, 1941. National Archives. Once the smoke cleared from Pearl Harbor’s dramatic events, the American government started an investigation into the attack to understand how the sudden assault took place. Taking the fall for the events of the day and the failure to respond were Rear Admiral Husband E. Kimmel and Lieutenant General Walter Short. Both were relieved of their commands shortly after the attack for not preparing the base with an appropriate defense. The most important consequence of the attack on Pearl Harbor was the American declaration of war against Japan. A poll taken between December 12–17, 1941, showed that 97% of American citizens supported a declaration of war against Japan. Of course, the war against Japan had been decided way before any public poll would take place. President Roosevelt formally requested the declaration in his Infamy Speech, addressed to a joint session of Congress and the nation at 12:30 p.m. on December 8. The declaration was quickly brought to a vote and it passed the Senate, while it would later pass the House at 1:10 p.m. The vote was 82 – 0 in the Senate and 388 – 1 in the House. Jeannette Rankin, a pacifist and the first woman elected to Congress (in 1916), cast the only vote against the declaration, eliciting hisses from some of her peers. Dropping of the atomic bomb on Hiroshima. Morning Ticker. By drawing the United States of America into World War II, Japan engaged a formidable enemy that eventually led to the total destruction of the Japanese military in 1945. Undoubtedly, the most catastrophic of the consequences of Pearl Harbor had on Japan was the dropping of two atomic bombs on the cities of Hiroshima and Nagasaki. Contemporary historians suggest that at least a hundred thousand people lost their lives immediately, while various estimations imply that as many (if not more) died over the following month from the lethal effects of the bombs.